Do you have a go-to dessert for a specific holiday? I tend to choose lemon bars and a fresh coconut tart for Easter. For Christmas I lean towards cookies, candies, and gingerbread. And Thanksgiving? Well, Thanksgiving it's always pie. It really never seemed like Thanksgiving if there wasn't pie for dessert. Not that it was a rule or anything...technically. But if it was a rule, I would have broken it this year. Of course, this year seemed anything but traditional. I usually spend a solid month planning and re-planning my menu. I paste together bits and pieces to make what I think will make the perfect meal for the year. I have a notebook. It has headings. If you were to glance at it, you'd see Turkey and Gravy, Stuffing (which I should technically call Dressing, because I never actually stuff it into the bird), Potatoes, Sweet Potatoes, Cranberries, Applesauce (the applesauce is always the same, but I still list the category and fill it in), Sides (because potatoes, sweet potatoes, cranberries, and applesauce are always there in some form or another...but the sides often change from year to year), Bread, Drinks, and Desserts. Into that notebook also goes a shopping list, a prep schedule, and a cooking schedule. It goes with me everywhere during the month of November, leading up to the big day. You know, in case I have any things that need to be immediately added or changed. Lest I forget those changes before I return home. This was the first year that two or three pies were not listed under Desserts. Some years, I just use Pies as the heading, as I know that's all that will be there, anyway. But really, not a single pie. I went out of the norm and made a Cranberry Clafoutis and a twist on one of our family favorites, a Spiced Pumpkin Rum Flan. 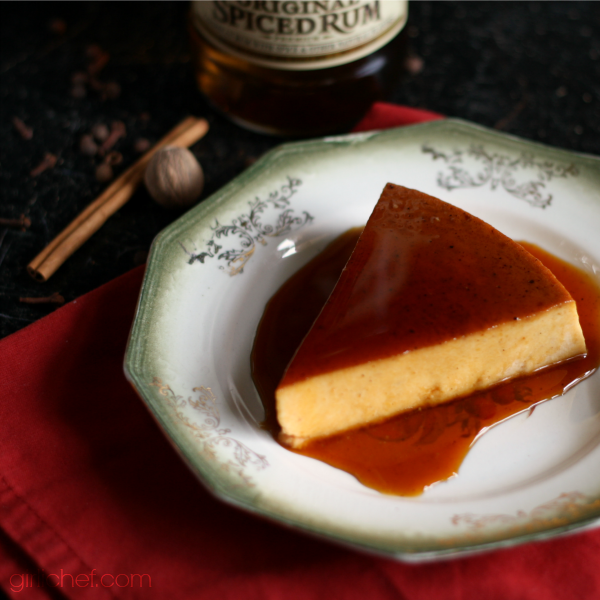 I usually try to add one boozy pie to the mix anyway, so a boozy flan wasn't too far off. Now, I'll admit that deep down, I did miss my ritual coffee and a slice of pie a half an hour after the big meal. It's just a part of (my) Thanksgiving. But it wasn't because the desserts weren't amazing additions to the table. They just missed a pie alongside them is all. Preheat oven to 325° F. Fill a large pot with water and bring it to a boil. Set a 9-inch cake pan inside of a roasting pan. Place sugar and water in a small saucepan over low heat until the sugar turns into a liquidy syrup, swirling it around every once in a while. Remove from heat just before the syrup turns the color of maple syrup (10-12 minutes) and stir in the spice. Pour into the bottom of the cake pan and tilt the pan back and forth so that the caramely syrup coats the bottom of the pan; tilt it so it goes slightly up the sides, as well. It will fall back down into the bottom. Place all of the custard ingredients into the jar of a blender and blend until everything is combined and mixture is smooth. Pour slowly into the pan with the caramel. The caramel will have begun to "set" by now, but will so even more when this mixture hits it. Carefully set the roasting pan (with the cake pan in it) into the oven and pour the boiling water all around it. The water should reach at least halfway up the pan, but no further than three-quarters of the way up. Do this as quickly as possible and shut the oven door so as to not lower the oven temperature. Bake for 60 minutes or until the flan is just set. When you touch it lightly in the center, it will still seem very jiggly and maybe stick slightly to your finger, but it should not be at all liquidy. 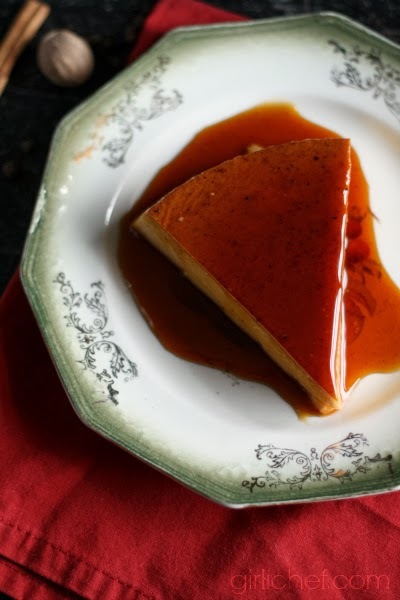 You may be tempted to over-cook the flan, but please don't. 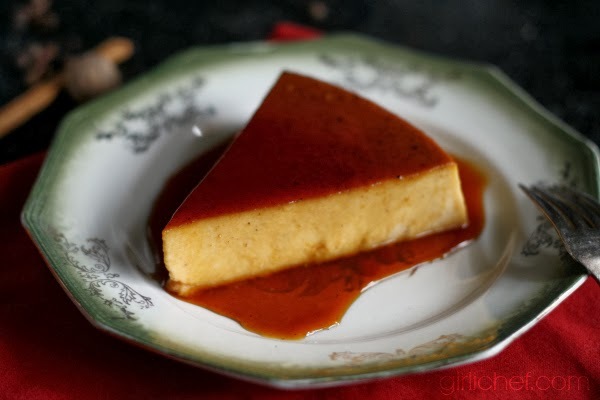 Over-cooking (as well as no water bath) is what causes that "holey" look throughout the flan and gives it an overly eggy taste and bad texture. Cooking this way keeps it creamy and perfect. Carefully remove the roasting pan from the oven. You can let the pan sit inside the water bath for 5 or 10 minutes, but I wouldn't go any longer. Lift the pan out (use some oven mitts or towels) and set it on a wire rack and let cool to room temperature. Cover the pan with plastic wrap and refrigerate at least 4 hours, but up to overnight or a bit longer. When you're ready to serve, run a thin-bladed knife around the outside edges to release from pan. You should be able to move the pan in a back-and-forth motion (like turning the wheel of a car...if the wheel was laying down horizontally) and the flan will easily move back and forth. Invert a serving plate (with a lip to stop the caramel from flowing off) onto the pan. In one swift motion, with one hand holding the bottom of the plate and the other holding the bottom of the pan, flip everything over so that the plate is now on the bottom. You should hear the flan plop onto the plate. 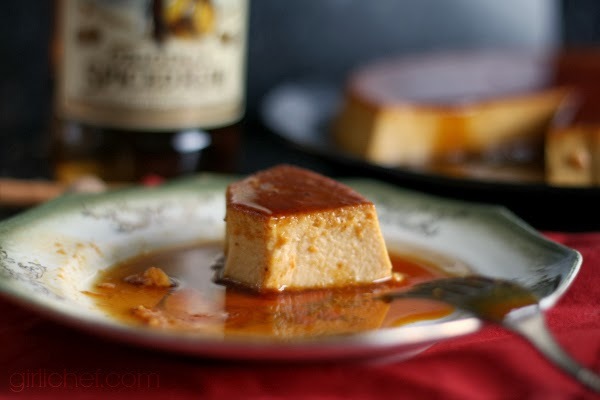 Lift the pan off and allow the caramel syrup to fall down onto the top of the flan. There will be "extra" stuck to the pan, but you won't need it, as plenty releases (use hot tap water to dissolve sugar from cake pan).